INFOSY'S GANG: When looking at what makes entrepreneurs famous, successful, and great, it helps to look at the story of how they become the great entrepreneur that they have turned out to be. Entrepreneurs don't get famous and successful overnight, it takes time for them to grow into their success. But here's what distinguishes an entrepreneur from the rest of the pack: the entrepreneur takes a concentrated stab at making his dreams of starting his own business a reality. Successful entrepreneurs always manage to keep their eyes and ears open. They are a cut above ordinary because they show interest in the competition and are always innovating in the market. Entrepreneurs also encourage new ideas from all levels. They don't just talk...they do. One way to understand how entrepreneurs become famous and successful, is to look up close and personal at one. He founded India Infosys in the late 1970s when he made a decision to quit his job as research assistant and started his own software business. In the late 70s computers were entering India in a big way. So Mr. Narayanmurty saw an opportunity and he took a course of action to position himself as a leader in that opportunity. But here's his challenge: Mr. Narayanmurty he had a vision with zero capital. And he recognized that he vision without capital would get him nowhere. So, in 1981 Mr. Narayanmurty borrowed some money from his sweetheart, partnered with six colleagues, and made his dream a reality. And through enormous interest and hard work, his hard work began to pay off. 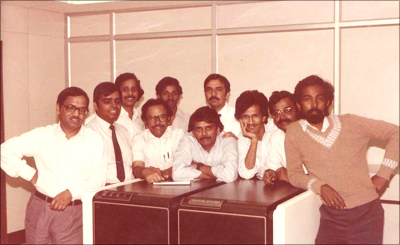 By 1983 Infosys was able to get their first client, MICO, in Bangalore. And today, Infosys has achieved many firsts with it's name. Infosys was the first to offer stock options to its employees. And, for the first time in 2004, Infosys crossed $1 billion revenue mark. Entrepreneurs show avid interest in their business and try to expand their zone of operation in business fast. When they recognize that they have problems, they don't try to go at it alone. They find people who will join their team and then they spell out their vision clearly and succinctly. In fact, it is imperative that those entrepreneurs who allow their firms to go public, share their vision with others so that their will be followed by their predecessors. This goes a long way to ensure perpetuity of the company. Otherwise, the company may fail after the entrepreneur who started the business passes away. Also, I've found that entrepreneurship is relative depending on the economic conditions of where you happen to be. Entrepreneurs flourish in a free economy. They are stifled in a State run economy. So...the debate: are entrepreneurs born or made? Is entrepreneurship inherited...or is it something that is picked up along the way. Here's my take on it: entrepreneurs are partially born and then made. When they enter the world, their instinct makes them enter business. Then they acquire skills from the environment and then succeed. They give employment to themselves as well as to millions of people. Join in and write your own page! It's easy to do. How? Simply click here to return to The Defining Characteristic Of A Great Entrepreneur. The Discussion..